Welcome to Julie’s professional profile. Julie studied in Canada and the US at various schools and with teachers and mentors in pursuit of her current career. She graduated with distinction from the John Molson School of Business in Montreal and held executive positions in sales and marketing. Julie studied at the Institute NHC in Montreal where she pursued studies in vibrational medicine, spiritual psychotherapy, energy healing and Therapeutic Touch. She is a professional Certified Life Coach and graduated in 2007 from Coach for Life, an ICF-accredited Certified Life Coach Training. She holds both the International Coach Federation credential of an Associate Certified Coach (ACC) and Certified Mentor Coach (CMC). Julie also completed the Now What?® Authorized Facilitator program with Laura Berman Fortgang and specializes as well in career and life direction. In addition to being a Life Coach and Mentor Coach, Julie is an advanced Six Sensory™ Practitioner and Intuitive Consultant, trained by world-renowned teacher, best-selling author and vibrational healer Sonia Choquette. Julie trained with Mindful Schools in 2016, based in California where she committed to deepening her own mindfulness practice and began her training to bring Mindfulness into schools Pre k-grade 12. Over the years, Julie has completed numerous programs and retreats that have enriched her daily personal and professional life. They include the following: Byron Katie’s 9 day The School for The Work in Los Angeles, California, 5 day Silent retreat with Gangaji, Weekend retreats with Joan Borysenko, Dr. Christiane Northrup, Dr. Daniel Siegel, Carolyn Myss, Sonia Choquette and both individual and group process work with Montreal’s Madonna Maher of Core Energetics Montreal and Josee Martel of Radical Aliveness. Parenting two beautiful boys, has introduced Julie to the wonderful world of parenthood, developmental child psychology and needless to say, humble pie. She has since been stretched, prodded, poked and deeply loved by these two gorgeous souls. The work of Dr. Gordon Neufeld and the Neufeld Institute facilitators in Montreal have been invaluable to her in assuaging the growing pains of child rearing and enlightening her on her parenting path. 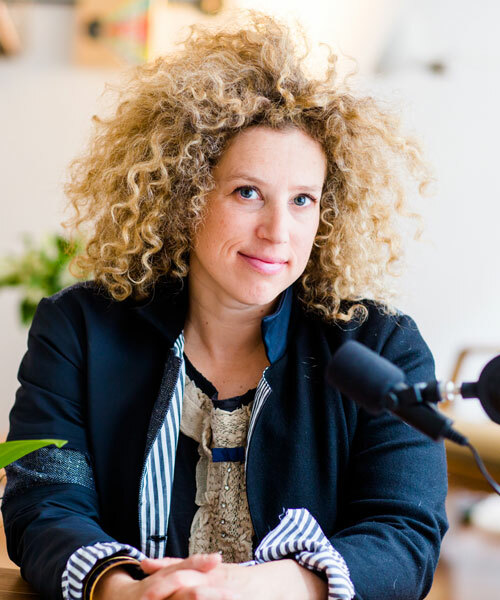 Julie’s first radio show Heart Beat which began in 2009 on BlogTalkRadio has since emerged as a new incarnation: Julie in conversation, a live weekly podcast featuring conversations with renowned authors and pioneers helping us create positive change in our individual and global lives. You can listen to Julie’s personal journey along with pioneers and experts in the field of marriage, pregnancy and birthing as she encountered them for the first time. Beyond I do, Getting Married Consciously was the first series created that featuring experts in the field of marriage and spirituality as Julie made her way to the altar. On the heels of this first series, Julie created a follow up series as she made her way through pregnancy for the first time. You can listen here. Conscious Pregnancy Empowering Birth; a woman’s rite of passage into creating new life. The series features reknown experts in the field of pregnancy and birth.